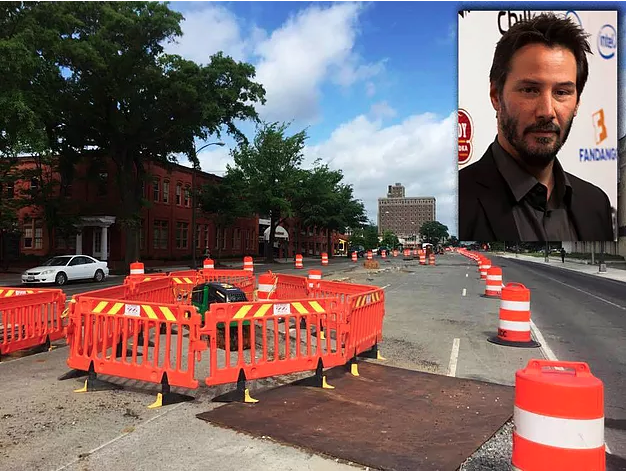 RICHMOND, Va. — Officials from the Greater Richmond Transportation Center (GRTC) announced today that, in an effort to expedite the ongoing construction of the Bus Rapid Transit (BRT) system, famous Hollywood actor Keanu Reeves has been contracted to assist in its completion. The BRT system, often referred to as GRTC Pulse, is a high-capacity transit system that will connect the city’s East End and West End through the inner-city neighborhoods. After years of anticipation that came without delivery, construction on the BRT finally began earlier this year. However, despite the dedicated efforts from construction crews working around the clock, the project has yet to fully get off the ground. The delay has been met with much frustration from many, including GRTC engineer Dale Sheppard, the mastermind behind the BRT layout. “The delay is becoming a serious problem, which needs a serious solution in response,” he stated in a recent interview. Reeves, who is best known for his performance in the seminal 1994 classic film “Speed,” is no stranger to fast-paced transportation and was offered a part on the team after meeting with Sheppard.